Some franchising opportunities can be expensive. High start-up costs, enormous overhead, and HR headaches are just a few drawbacks. But not all brands are that way. The Florida-based IceBorn ice and water vending machine franchise company offers an initial investment opportunity of as little as $27,500, plus site preparation, shipping, and installation fees. This low-cost point of entry allows entrepreneurs to launch a business or even purchase multiple locations and machines. Franchisees can choose from three different units which are all freestanding, 24/7, automated retail ice and water destinations offering bagged or straight-to-cooler ice that is filtered, clean, and made on demand. The initial investment ranges from $27,500 to $150,000. You might think of it like this, the same million-dollar investment required for a burger franchise could purchase eight IceBorn units that can be situated in just about any parking lot and require only 200 square feet of space. 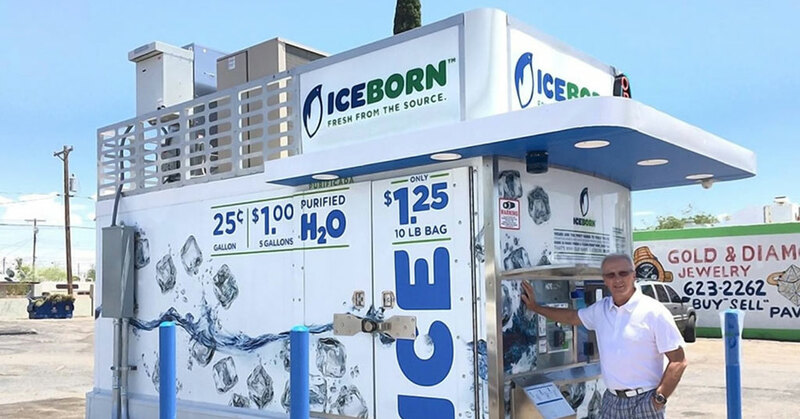 IceBorn ice and water vending machines will work in strip shopping centers, stand-alone big box stores, and even car washes – virtually anywhere with water and electrical hookups. The IceBorn brand offers even further incentive for the burgeoning business owner. There is no need to hire employees, and the business can be managed remotely 24/7 with their proprietary SmartIce™ Remote Management System. This makes it ideal for owners looking to grow their revenue, but not their overhead or work hours. The brand’s SmartIce™ can be accessed from any computer, tablet, or smartphone allowing owners the opportunity to monitor all transactions, including the tracking and summarizing of sales on an hourly, daily, weekly, monthly, and annual basis. Owners can also fix, reset, and schedule maintenance via the live video camera system, which gives them the ability to view the inside and outside of the machine. SmartIce alerts owners on the use and replacement needs of wearable parts, bin capacity, and when a transaction is made, and can even vend a free bag of ice or control hours of icemaker output. All of these features and benefits of the IceBorn brand are what convinced Joe Tooke to become a multi-unit franchisee. He says he liked the business model of multi-unit ice and water machine operation and became a franchisee and area developer in the Tucson, Arizona market. Six years after he launched his first machine, Tooke now successfully owns and operates ten machines within his market and highly recommends ice and water vending opportunities as a semi-passive investment, supplement to an existing business, or full-time career opportunity. Tooke says IceBorn’s streamlined operations system is a follow-the-playbook success story for entrepreneurs. The corporate team provides franchisees support in finding properties, site development, grand opening, ongoing marketing needs, and area development assistance. For entrepreneurs with limited investment capital or who just want a secondary income without the headaches, IceBorn provides a great opportunity to get in on a great business model that is sure to pay dividends for many years to come. You might even say IceBorn is right in the “sweet spot” of franchise investing.